345 Marlborough is located on the north side of Marlborough, between Gloucester and Hereford, with 343 Marlborough to the east and 347 Marlborough to the west. 345 Marlborough was built ca. 1872 for builder and contractor George Martin Gibson, for speculative sale, one of eleven contiguous houses (337-339-341-343-345-347-349-351-353-355-357 Marlborough). 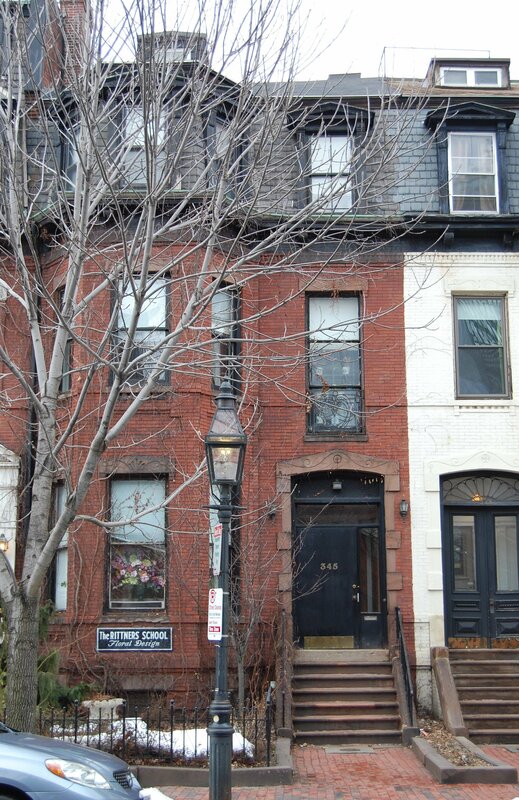 Click here for an index to the deeds for 345 Marlborough. On November 15, 1873, 345 Marlborough was purchased from Hiram Gerrish by Joseph McIntire, a wholesale provisions (produce) merchant in partnership with Elbridge G. Knight in the firm of Knight & McIntire. On the same day, Hiram Gerrish also sold Joseph McIntire 337 Marlborough, 355 Marlborough, and 357 Marlborough, and sold Joseph McIntire and Elbridge Knight, as partners, 347 Marlborough and 351 Marlborough. They purchased the houses as rental property or for re-sale. By 1873, 345 Marlborough was the home of tobacco broker William C. Waters and his wife, Susan L. (Whittredge) Waters. They previously had lived in Jamaica Plain. 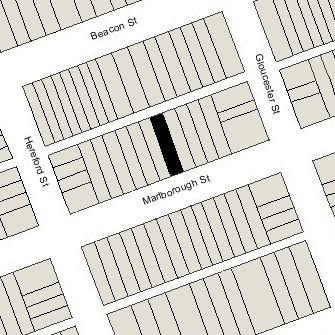 They continued to live at 345 Marlborough in 1874, but had moved to 286 Marlborough by 1875. By 1875, 345 Marlborough was the home of George Washington Warren and his wife, Harriet Atwood (Willis) Warren. They previously had lived at the Hotel Pelham at the southwest corner of Boylston and Tremont. George W. Warren had been a dry good merchant until 1857, when his business failed. He subsequently became a banker and note broker, and then superintendent of agencies for the New York Life Insurance Company. They continued to live at 345 Marlborough in 1877, but had moved to 10 Ashburton Place by 1878. On October 15, 1877, 345 Marlborough was purchased from Joseph McIntire by Susan Amelia (Church) Russell, the wife of Edward Thomas Russell, a wholesale fish merchant. They previously had lived at 32 Dwight. Living with them was Susan Russell’s nephew, Edmund Valentine Church, son of William Simmons Church and his wife, Hannah Sherman (Wilbur) Church. He continued to live with them until about 1882, when he moved to Chicago, where he became a music dealer. By 1880, the Russells had been joined at 345 Marlborough by Susan Russell’s niece, Edith Russell Church, the daughter of John Church and his wife, Carrie (Corwin) Church. Edith Church continued to live with them until her marriage in June of 1897 to Roswell Beebe Burchard, an attorney and future Speaker of the Rhode Island House of Representatives. After their marriage, they lived at 45 Bay State Road and at Old Acre in Little Compton, Rhode Island. Edward Russell died in April of 1900. Susan Russell continued to live at 345 Marlborough until her death in October of 1913. 345 Marlborough was not listed in the 1914 Blue Book. On May 4, 1914, 345 Marlborough was purchased from Susan Russell’s estate by John Woodbury. He and his wife, Jennie Russell (Churchill) Woodbury, made it their home. They previously had lived at The Empire at 333 Commonwealth. They also maintained a home in Ponkapoag and later in Canton. John Woodbury was an attorney and also had served from 1896 to 1911 as Secretary of the Metropolitan Park Commission. The Woodburys were joined at 345 Marlborough by Jennie Woodbury’s sister, Josephine Hill Churchill. She traveled frequently, but continued to live with them when she was in Boston until about 1924. They also were joined by John Woodbury’s unmarried nephew, Harold Woodbury Parsons, the son of John Woodbury’s brother-in-law and sister, Edward P. Parsons and Marcia Eola (Woodbury) Parsons. In 1910, he had lived with his mother at 348 Commonwealth. Harold Parsons was a student and later would become an art expert who spent much of his time in Rome, where he represented various art museums in acquiring works of art. In 1956, he was charged by the Italian police as being part of a ring of antique dealers illegally exporting Etruscan art. It is unclear whether he was convicted of the charge. In 1961, he exposed the sale of fraudulent Etruscan art to the New York Metropolitan Museum of Art. In 1931, Josephine Churchill resumed living at 345 Marlborough. Jennie Woodbury died in January of 1932. John Woodbury continued to live at 345 Marlborough with Harold Parsons. Josephine Churchill lived with them until about 1937. John Woodbury died in January of 1940, and Harold Parsons moved soon thereafter. 345 Marlborough was shown as vacant in the 1941 City Directory. On November 1, 1941, 345 Marlborough was purchased from John Woodbury’s estate by Willem (William) Friso Frank, an organist, and his wife, Alice R. (Barlow) Frank. They previously had lived at 91 Gainsborough. In March of 1942, he applied for (and subsequently received) permission to convert the property from a single-family dwelling into a lodging house. 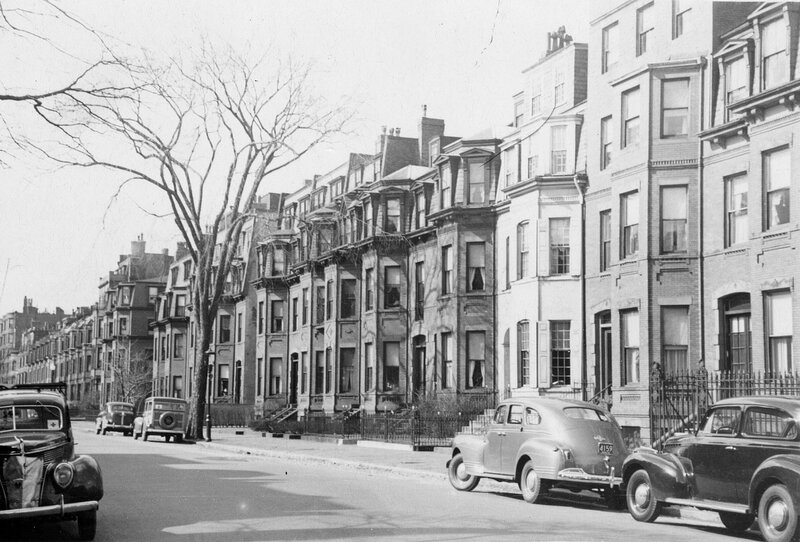 The Franks continued to live at 345 Marlborough until about 1954. On October 1, 1954, 345 Marlborough was acquired from the Franks by Philip Arnold Knowlton, an editor with Houghton-Mifflin publishing, and his wife, Helyn Louise (Protzman) Knowlton. They previously had lived in an apartment at 15 Marlborough. Helyn Knowlton’s mother, Lydia (Vaughan) Protzman, lived with them; she previously had lived in New York. Philip Knowlton died in April of 1959. Helyn Knowlton, an artist, continued to live at 345 Marlborough with her mother until about 1961. Lydia Protzman died in 1962 and Helyn Knowlton moved to an apartment in The Colonial at 382 Commonwealth. On October 23, 1961, 345 Marlborough was acquired from Helyn Knowlton by John W. Hawkins and his wife, Virgiletta Ruby (Morrow) Hawkins. They previously had lived at 250 Massachusetts Avenue. On June 11, 1962, 345 Marlborough was acquired from John and Virgiletta Hawkins by Carl Frederick Rittner and his wife, Malca Eunice (called Eunice) Rost (Carin) Rittner. They converted the property into Rittners School of Floral Design, with an apartment for themselves. In January of 1980, they filed for (and subsequently received) permission to legalize the property as a school and one apartment. With their application, their attorney filed a letter attesting that the property had been used as such since 1963. In July of 1980, they filed for (and subsequently received) permission to construct a three-story addition at the rear of the property. On September 1, 1981, the Rittners transferred the property to themselves and their son, Stephen Rittner, co-partners in the Floral Realty Trust. Eunice Rittner died in August of 1984 and Carl Rittner died in February of 1999. 345 Marlborough remained Rittners School of Floral Design in 2017.